There are many important things that we do for our children, we make decisions for them because we believe that it is the best thing for them. One of the most important choices we can make for a child is their relationship with God. In baptism, parents and godparents make an important choice for the child who is anointed with oil, washed with water and given a candle. Baptism is a perfect way to celebrate a birth, a wonderful opportunity to thank God for their arrival, and the best way to start their life. 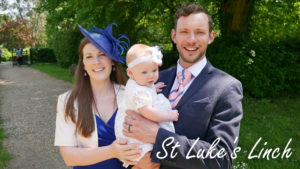 Who can get baptised at either of the St Lukes Churches? Anyone who lives in the parish of either church or who comes to church regularly. Nothing – they are two words for the same thing. Do the parents have to be baptised? No. Anyone can bring a child for baptism. Who can be a God Parent? Anyone old enough to understand what they are saying and committing to can be a Godparent. Because they will make the baptism promises for their God Child, they must have been baptised themselves. Nothing, baptism is absolutely free. No. Anyone who wants to become a Christian begins by being baptised. If you haven’t been baptised and want to talk about it please speak to our Rector. If you are interested in baptism, either for your child or yourself, or just want to know more please get in touch.